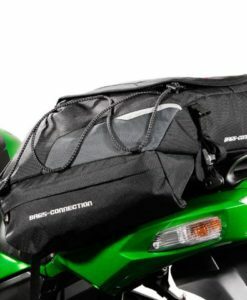 Anyone who spends any sort of time whatsoever on a motorcycle will very quickly come to appreciate the value of a good, dry and sealed luggage bag. 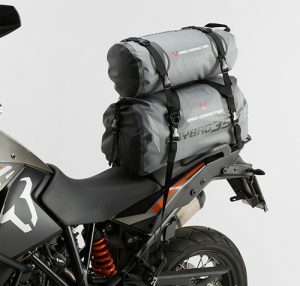 The very nature of motorcycle touring in South Africa ensures that a rider will either be exposed to dusty conditions or rain or a combination of both. 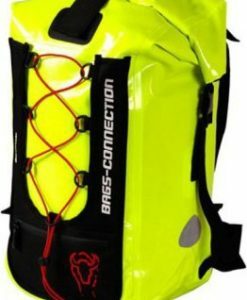 It makes sense then to ensure that you arrive with your important gear intact particularly if it comprises expensive and sensitive electronic items. 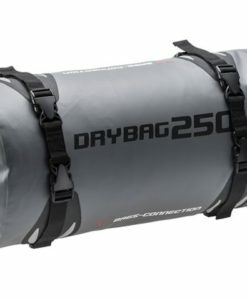 Dry clothing is also an equally important imperative. 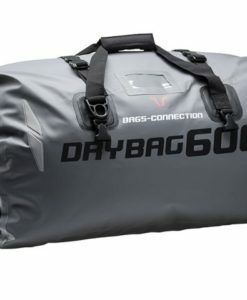 Even on short day trips, a dry bag should be considered to store such essentials as your wallet, laptop, camera and your car keys (which often have car alarm devices attached). 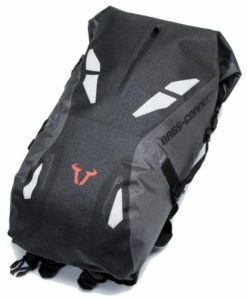 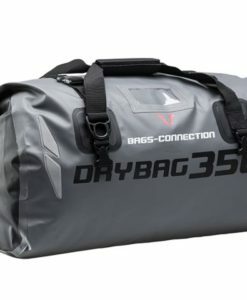 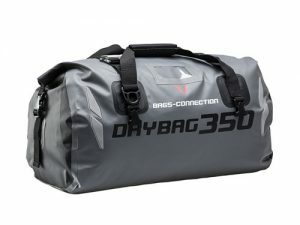 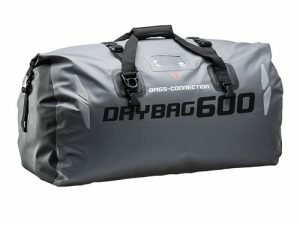 The range of Bags Connection waterproof bags have been designed in Germany specifically for rugged motorcycle applications as they are made from superior TPU as opposed to cheaper grade PVC. 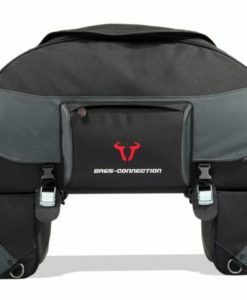 Each product has a full IP 66 rating (see below for more details) and has many biker specific features. 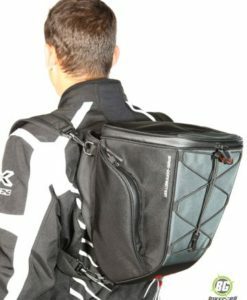 Designed by bikers for bikers. 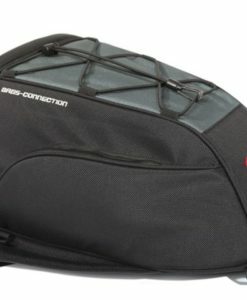 Designed in Germany for maximum flexibility the worlds first waterproof tail saddle bag that is expandable in both width and height. 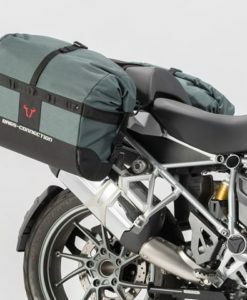 The original super tough 35 L & 60 L roll bag for motorcycles now with Click it, allowing a rider to increase luggage capacity by simply clicking on other drybags in the range. 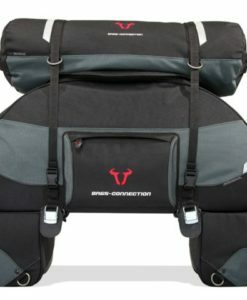 A modular pack system with maximum flexibility offering significant advantages over a single bag of the same volume. 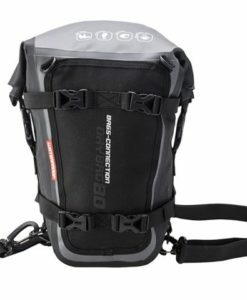 The integrated Click it system allows each bag to mount directly to your bike, either independently or in conjunction with other drybags in the range (Drybag 250, 350, 450, 600 ,620). 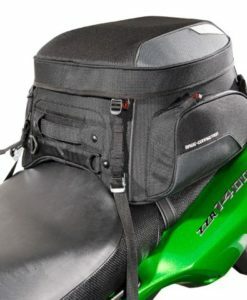 Use as a tankbag, tailbag, pannier topper or wherever you require secure storage. 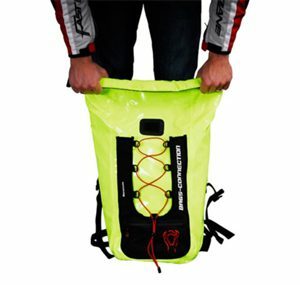 Easy to remove from your bike. 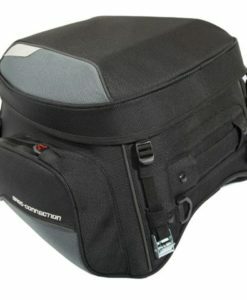 Sling over your shoulder with supplied shoulder strap. 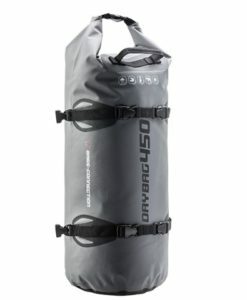 What is an IP 66 waterproof rating rating? 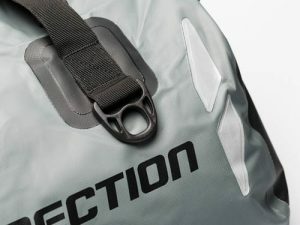 For LIQUIDS (the 2nd number) the rating of 6 ensures the bags contents are protected completely from powerful water jets. 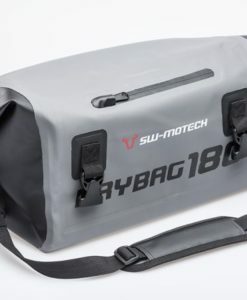 Powerful water jets are defined in the code as: water projected in powerful jets (12.5 mm nozzle) against the enclosure from any direction shall have no harmful effects. 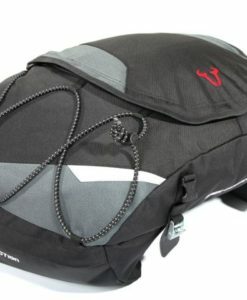 What are the benefits of TPU(Thermoplastic polyurethane ) vs. PVC? 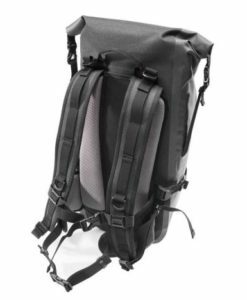 Because of the combination of chemical resistance, toughness, abrasion and low temperature flexibility, design engineers and processors choose TPUs for their applications in severe or harsh environments such as outdoor military equipment. 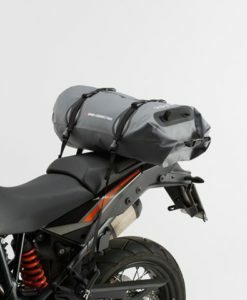 Strong enough for the military and adventure bike touring. 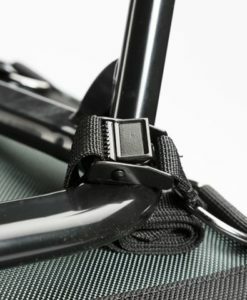 The strength and toughness of TPUs (Thermoplastic polyurethane ) result in extremely high puncture and tear resistance. 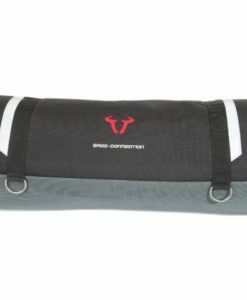 TPUs offer a long-term protection in the most demanding applications. 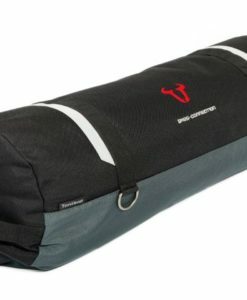 PVC is dangerous when it’s manufactured and when it burns. 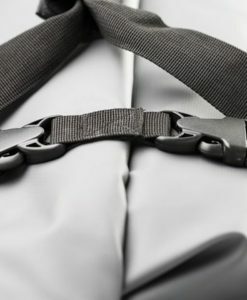 Large amounts of chlorine (66 percent of the world’s chlorine supply) are required to manufacture PVC, with dioxin produced as a bi-product. 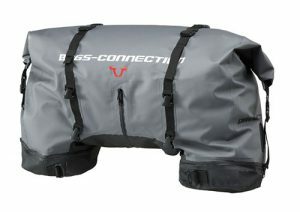 There is currently no successful method of recycling PVC, a known carcinogen since 1966. 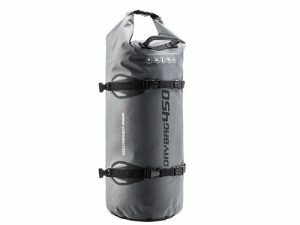 This tentbag can be attached to the SW-MOTECH  CargoBag, Racepack, or Evo Speedpack. 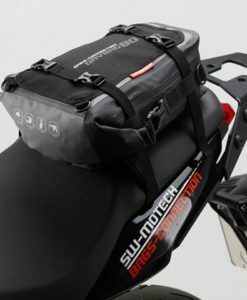 The SW-MOTECH  EVO Cargobag motorcycle luggage system is a  50-liter tail bag suitable for long weekend trips. 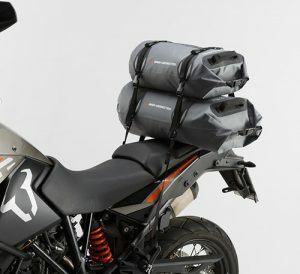 Fits on most adventure motorcycles. 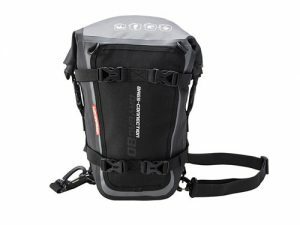 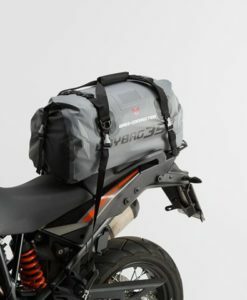 The Drybag 80 (8 L) is a multipurpose motorcycle dry-bag that can be used as a tankbag, dry-bag or even an over the shoulder backpack, all straps are included with the bag. 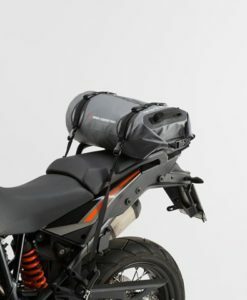 A motorcycle touring luggage offering 75 litres to 90 litres capacity, for the super prepared rider. 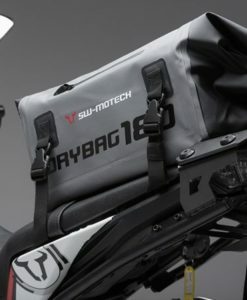 Super lightweight and waterproof SW-Motech Tailbag Drybag 180 is designed for true convenience. 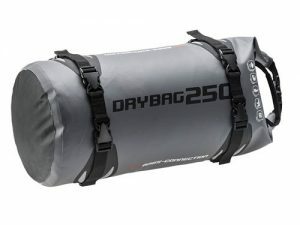 Made from Tarpaulin, a durable and easy to clean material capable of withstanding all types of weather conditions.